Click this link to see all of our cute: Design Choices available. 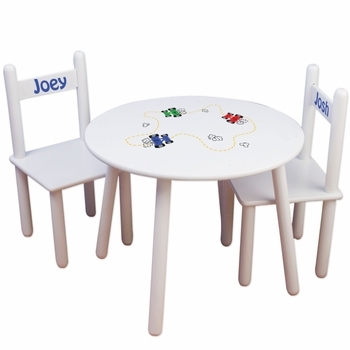 This personalized child sized table and chairs set is a wonderful addition to any child's room. The table measures 23 1/2 inches in diameter and 18 inches high. It is perfectly sized for children and comes with two chairs that can be personalized with the names and design of your choice. You can personalize each chair with a different name, and if there is one child, the second chair can be imprinted with "Guest" or "Friend", etc. The chair seats are 12 X 12 and 12 inches high. The chair backrest is 23 inches high. Easy assembly (no tools required) and all ink is certified non toxic.